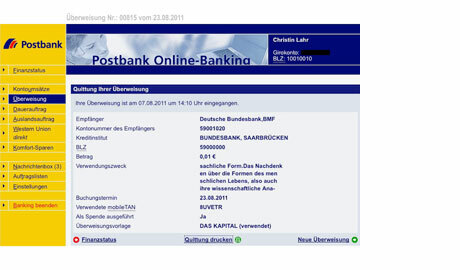 Since May 31, 2009, Christin Lahr has been making daily money transfers of 1 cent to the German Federal Ministry of Finance, thus helping to counter the growing mountain of debt in small doses. In the field "reason for payment", she always writes 108 characters from "CAPITAL: A Critique of Political Economy" by Karl Marx. That way, bit by bit, the entire text of the book will be transferred into the state’s central account via online banking. The transmission of the roughly 15,709 cents and 1,696,500 characters will take about 43 years. MACHT GESCHENKE, which inscribes itself irrevocably into accounts and archives, is a donation to the entire people, entered into the state budget, administered by the currently elected representatives, safely stored at the Bundesbank. Each of the money transfers is documented by Lahr by a screenshot, printed out once, signed, and given away to individual citizens. 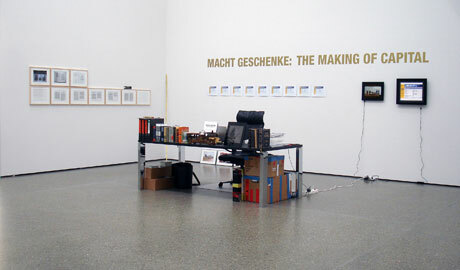 During the festival, the artist will temporarily install her work station at a capital desk, taking over the chair of Louis Tobback (Mayor of Leuven), exposing bureaucratic structures, delivering an illustrative insight into the "cultivation" of capital, communicating and performing: MACHT GESCHENKE: THE MAKING OF CAPITAL.